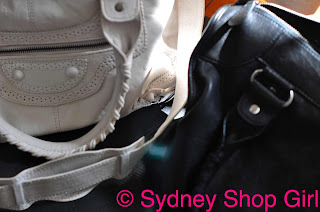 Sydney Shop Girl: Shopping for the Holiday. I'm Too Old for the Extreme Sport of It Bag Pursuit. Shopping for the Holiday. I'm Too Old for the Extreme Sport of It Bag Pursuit. 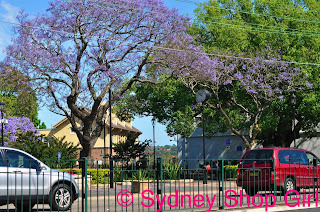 One of the things I love most about where I live are the jacaranda trees. There's a street I have to jog uphill and the sight of the two jacarandas arching over opposite sides of the road to meet overhead in a burst of lilac-y purple against the dawn sky is just what I need to get me to the top. It's a special light at that time of the day. It makes the jacaranda flowers look so striking against the dark of the tree branches and the sky. I hope that one day I'll be able to take a proper photo of it. It's just under a week until we fly off to Singapore for the weekend. It's never too early to start packing and planning. I've located the perfume sample card of the Hermes fragrance I'm hoping to find at the duty free. I'm keeping it in the safest place I know - on the fridge in the kitchen. Come to think of it, the travel itinerary is there too. Just to be extra safe, I'm going to put everything under the same fridge magnet. Kiehl's face cream for mum and Lush bubble bars for me in the bath at the hotel. I'm really excited because we'll be meeting up with my mum and dad in Singapore. I was meant to bring mum back ups of her favourite face cream. I went to Mecca Comsetica looking for ReVive's moisturizing renewal cream. Bad news, ReVive fans - the whole brand has been withdrawn from Australia. I have seen the range on Strawberrynet today though, if you're in need. Apparently, a good substitute which Mecca Cosmetica does stock, is Chantecaille's Flower Harmonizing Cream. I ended up at Kiehl's at DJ's where there was a 15% off sale going on. It took a bit of guess work and extrapolation but I think I've found mum a substitute. It's the Abyssine Cream + (don't know what the + indicates). It's available with or without SPF. There's a complex list of active ingredients including red alga and a survival molecule called abyssine. Sci Fi, meet Skin Care. Regular readers will now be familiar with my pre holiday routine. It involves not only the packing and planning that normal people do but also shopping for the holiday. This close to Christmas, I could be sneaky and reference our American friends and call it shopping for the holidays. Either way you look at it, it's still shopping for me for the holiday(s). That covers everything in an honest manner. It was the day of 35% or so off. Everywhere I went in women's fashion, discounts in the 35% range were being offered. Witchery was no exception. 35% off for purchases over $500. The mathematics of Current Season Stock Discounting is different to that of the real world. Somehow '35% off' sounds almost like 'buy one, get another at half price'. 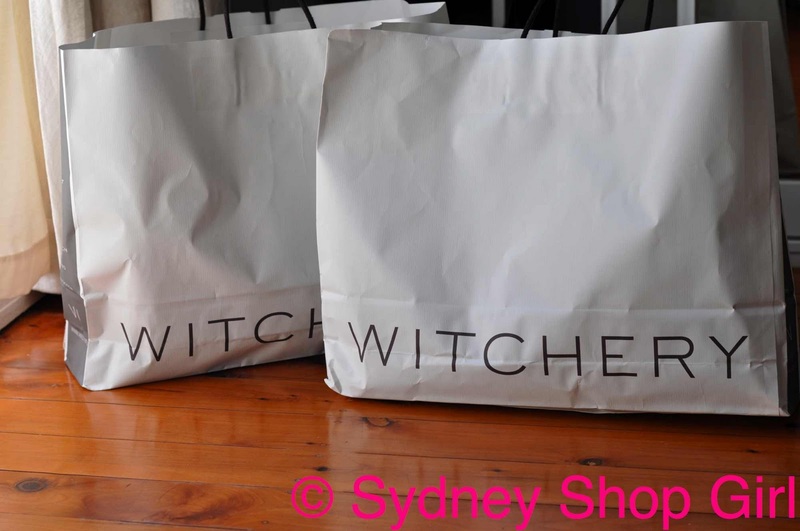 I like Witchery bags because they're light, hold a fair bit and have convenient pockets. They are reasonable value when on sale for on trend bags in practical colours. This is the Elise Whip Stitch bag. Witchery Elise Whip Stitch bag in Black. I know these bags look very much like the Balenciaga City bags but gee, I'm too old for the extreme sport of It Bag Pursuit. Bag features on the shoulder of a celebrity, bag sells out and has waiting lists everywhere, bag invariably extremely heavy when filled with day to day essentials causing shoulder strain and then, most alarmingly ... bag hibernates in dust bag for many, many months at a time. For the Balenciaga fans, the Witchery bag is an edit of various versions of the Covered Giant City bag and the City bag (I think this helps with copyright and intellectual property concerns). Some of the front studs are covered in leather, others are bare and the general size of the metal work is smaller than the current versions that Balenciaga are making. There are no tassles on the Witchery bag. 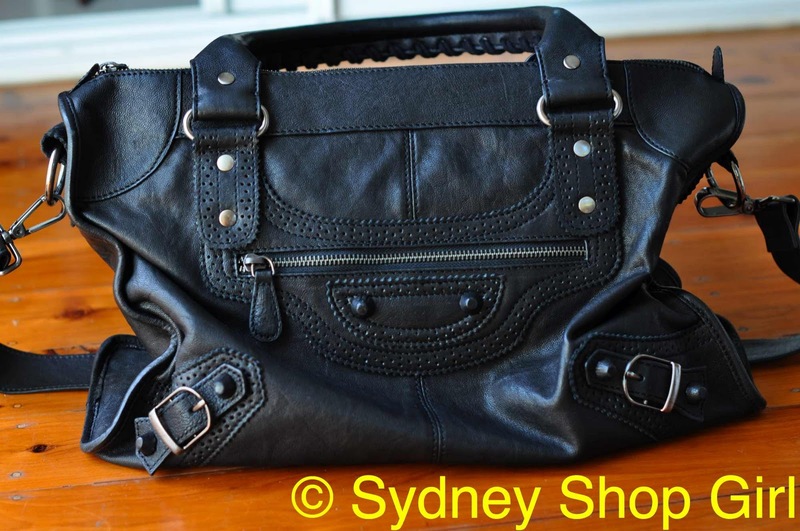 The shoulder strap is detachable and does have a pad on the strap for comfort. Don't get me wrong, I love handbags, I'm just striving for moderation these days. 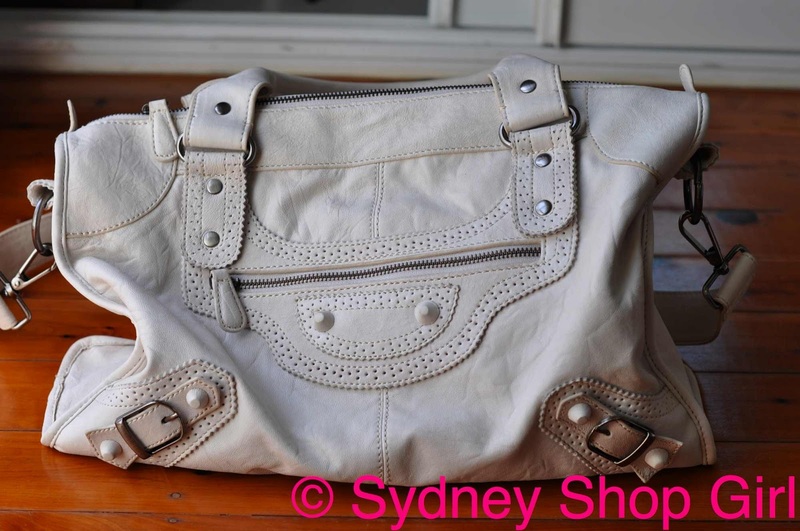 Fair price for a fairly on trend bag that I can have a bit of fun with and not be too precious about. Moderation is a relative thing. It goes without saying that under the influence of the rubbery figures of Current Season Stock Discounting, it makes perfect sense to buy the same bag in both black (of course) and an off white shade called 'plaster'. Witchery Elise Whip Stitch bag in Plaster. I'm not sure how long a white bag will stay white in my hands but I guess the experiment starts now. 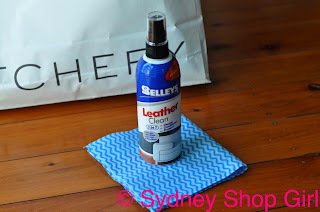 Just to give the bags the best possible start in my rather active and fast paced life, I gave them the once over with leather protectant. Both bags stood up well to a light wiping down with the spray. I'm planning to take the white bag to Singapore. I can see it getting a good day of shopping at The Ion. I hope there's a Zara there. I am in search of summer clothes at the moment. A kaftan and a navy and white striped tank top styled dress mainly. That's my next holiday planning job - writing a shopping list. Gorgeous bags! Well done! Love your pre travel rituals!! Hope you'll be able to fit in a Singapore Sling at Raffles??!! I too am a pre-trip shopper. I did it when I went to Canberra for work. Bought a pair of high heels to wear, to impress the GG - she didn't even see my shoes - and I couldn't walk in them at all (seeing I bought them the day before). I also went pre-trip shopping before my other Canberra trip - pjs, bags, undies, socks, toilet bag. It makes sense to pre-trip shop, but I really should save for the actual trip. Your bags are great. Witchery sales do indeed make us buy more. A Zara is coming to Melbourne! There is a Zara at ION. There's also one at Wheelock (just past the Coffee Club, near Hermes), 313 @ Somerset and Ngee Ann City. How do I know this? Apart from being a Singapore junkie, I got out my Singapore book of all my pre-planning- shop locations, restaurants, shopping lists etc. Love the bags - very nice. Hope they have the off-white one when I'm back in Sydney, might have to pick it up. I have been an avid user of Kiehl's Abyssine Moisturizer for a while now, got it first in New York in 2008 (I think?!) and had to wait for it to be released in London. So I think the Abyssine + should be a good product too. 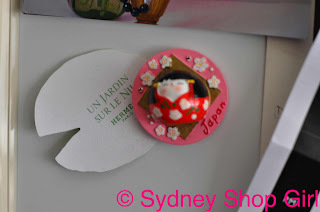 I agree with you about pre holiday shopping, I hate the "you should buy it when you get there"
I love Keihls, hopefully your mum will too, you are so organised remembering to bring bath bombs! I really rate Witchery bags, for all the reasons you have stated. I, too, am in search of a kaftan. I want one that doesn't make me look pregnant though... Mmmm may need to rethink the kaftan. Let me know if you find one! Love your new bags, and very interested in your "shopping for the holiday" philosophy, which I think I may have to just try out for myself! I am also trying to embrace thrift, so I should hit the sales and save money....mmm...yes, I've convinced myself that makes sense. TheStylishShoeGirl: yes! I will definitely have to have a Singapore Sling or two. Carly: pre holiday shops are such fun. BTW - nearly finished my piece. 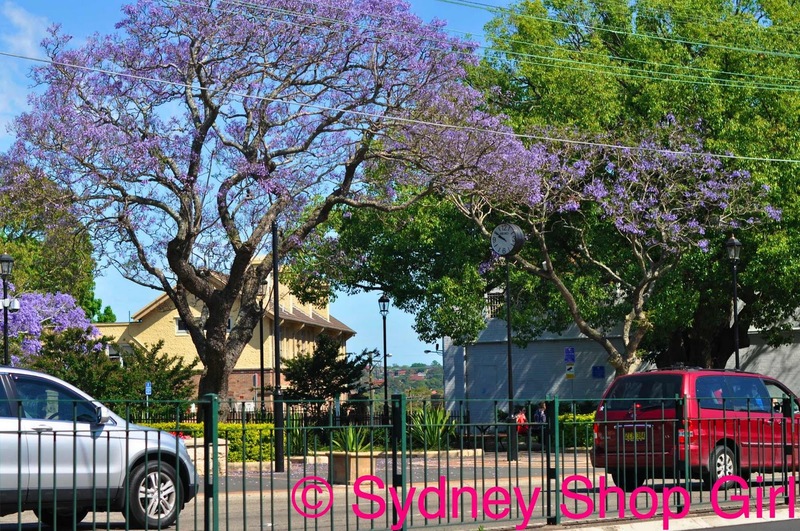 SemiExpat: I'm still in awe of jacarandas. I love running over the carpet of shed flowers under the trees. 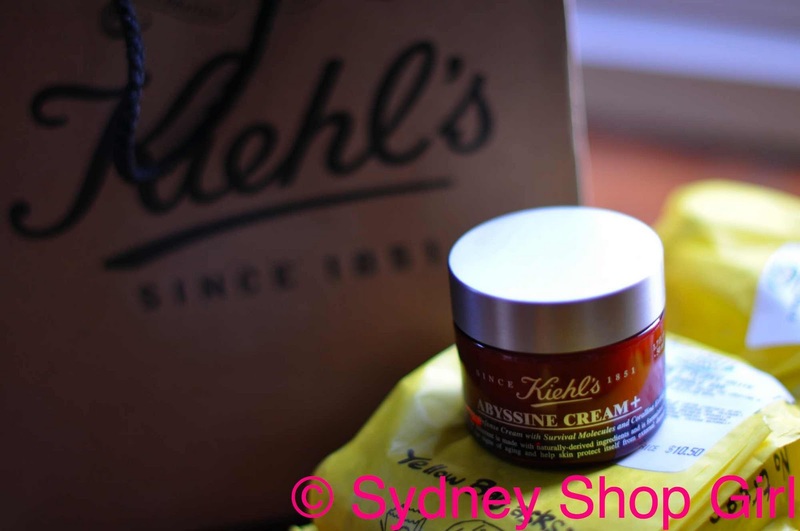 Jade: many thanks for feedback re Abyssine cream. samstillreading: THANK YOU for the Zara addy. Shannon: I'm about ready for a bath now. AFW: I was just thinking about the kaftan idea. Can we wear them to the shops? If the shops are kilometres away from a beach? Kate: I have a very loose definition of embracing thrift, myself. Especially at Christmas. Loved this post....The bags are hot and right on trend...I'm wearing my faux Channel that I picked up from Thailand to death so it might be due for an upgrade. Great idea with the bath bombs for the hotel...I'll have to think of that next time! The Jaded Vixen: thank you for your lovely comment and for stopping by. I think you can wear a kaftan anywhere. You just need to be in a kaftan state of mind to pull it off. If you love shopping, take time to visit Newton. This place is perfect if you are looking for something a little bit different and quirky.